Lightning Fast Shop (LFS) is an open source Python e-commerce solution that provides out-of-the- box fully functional online store with simple administration interface and elaborate design. Lightning Fast Shop (LFS) is an open source e-commerce solution based on widely-used software: Python, Django and jQuery. It can be quickly installed and easily customized. LFS provides out-of-the-box fully functional online store with simple administration interface and elaborate design. Lightning Fast Shop is BSD licensed package that easily adapts and extends. Its strictly separated data, logic and design make online stores quick and scalable. LFS supports HTML, CSS, MySQL, Postgres, Oracle, SQLite, Apache, lighttpd, nginx, etc. There is integration with Solr to enable more powerful search for LFS, including advanced full-text search capabilities, optimization for high volume web traffic, faceted search and filtering, highlighting, similarity search. Administration interface is simple yet powerful. Page content can be managed using WYSIWYG-editor. LFS supports different products types, including variants, customizable products and accessories. Their description can be set with any number of images, tags and attachments. LFS provides user-friendly search system, including faceting, related products (based on tags), ratings, filtering and comparing options for product properties. Product gallery (based on lightbox) and pluggable price calculation are advantageous features. LFS also payed attention to the marketing opportunities: sending of rating mails, featured products, topseller, vouchers, and discounts. LFS enables payment via cash on delivery, bank account, PayPal and credit card. Also this e-commerce system ensures simple administration of different payment prices per payment method, e.g. based on total order price, datum, etc. Via pluggable tax calculation LFS encourages work with taxes that are product or customer specific. One-page checkout makes payment even easier. LFS offers a number of shipping methods with simple administration of different shipping prices per shipping method, e.g. based on country, weight, size, etc. LFS provides many methods to improve search engine optimization, including well-formed and descriptive URLs, automatically generated sitemap, and meta keywords and description for all content (set automatically or manually). LFS is connected to Google Analytics Site Tracking and E-Commerce. LFS uses complex caching strategy in order to cache all parts of the site, even personalized parts, like the cart. This e-commerce system applies several caching backends (file- or memory based), including memcached, the fastest and most efficient caching system. 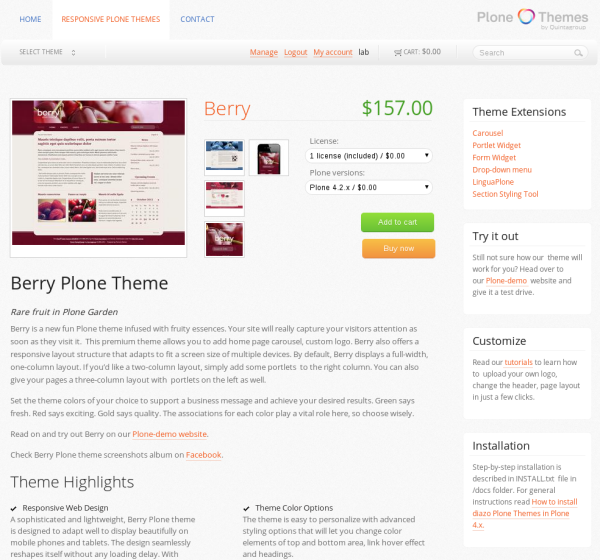 We developed our own online store for Quintagroup Plone themes on LFS, since it is flexible and allows pluggable backend. You can find more information in our Case Studies section. Contact Quintagroup and we will use our experience in providing Python e-commerce solutions to build full-featured and interactive online store for your specific needs.